We offer a range of exhibition display stands, including modular exhibition stands. All of our exhibition display stands are made bespoke to you and feature interchangeable banners. We have both PVC and fabric banner options for our exhibition stands, and also offer eye-catching inflatable arches made suitable and attractive for any exhibitions. Our range of exhibition stands include our fabric tension display stands, pop up display stands and our modular display stands. All of our exhibition stands feature interchangeable banners, allowing you to update and change your promotional messages as often as you like without having to buy the frames again. All of our exhibition stands are easily transported and are lightweight. They are supplied with carry cases making them easy to store and transport your exhibition stands safetly. How big is your exhibition space? Does your exhibition display stand need to be adaptable? What shaped frames do you want? Fabric Tension Exhibition Stands: These exhibition stands are available in a range of different shapes, giving you the ability to create an exhibition stand that is unique to you and grabs attention. Fabric tension display stands are made with fabric banners which stretch to fit the frame, this means that your display will not show any creases. Fabric banners also can be stored more easily that the PVC alternatives as they are harder to crease or damage. Pop Up Exhibition Stand: This is our only PVC banner exhibition stand. The pop up frame is easy to assemble and the banners attach easily using magnets. Modular Exhibition Stands: Our modular display stands allow you to adapt the size of your exhibition stand, they are height adjustable as well as allowing you to add or remove panels to fit your display area. Our modular exhibition stands feature fabric banners, making storing and transporting your exhibition stand easier, as you don't have to worry about creasing or damaging the fabric banners. We have two types of exhibition display stands that are on offer, a PVC graphic exhibition display stand and stretch fabric exhibition display stands. 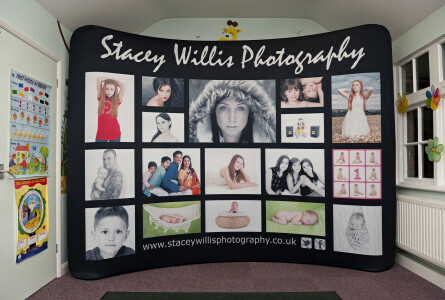 Our most popular display stands use our tension fabric, made from a unique Polystretch material. These exhibition display stands feature lightweight aluminium frames and fabric covers which stretch tightly over the frames, leaving you with a crease free, vibrant exhibition display stand that grabs attention. For more information take a look at our Fabric Tension Exhibition Display Stand section here. We also offer a range of PVC exhibition display stands. These exhibition stands feature a collapsible frame which is simply folded open. The PVC banner is then attached to the display stand using magnetic strips. This exhibition stand is available in two different sizes. For more information on our PVC exhibition display stand range take a look here. Where can you use your exhibition display stands? Our exhibition display stands are designed to be used at exhibitions and indoor events but are also extremely versatile and can be used in a range of other display environments.They are a great display stand solution for retail environments, allowing you to display new products or show off new promotions. Some of our exhibition display stands, such as inflatable arches, have been used in car showrooms, helping to creating an impressive backdrop for new car launches. Do your exhibition display stands feature interchangeable banners? Yes, all of our exhibition display stands have interchangeable banners, allowing you to update your promotional messages whenever you need to. Can you adjust the height of your modular exhibition display stands? Yes, you are able to add another row of posts on top of your modular exhibition display stands, allowing you to double the height of your display. Our modular display stands are also available in a range of height options. What is the difference between a fabric banner and a PVC banner on your exhibition display stands? PVC banners are the most common banner type used for exhibition display stands. However, here at House of Flags, we mainly offer fabric banners. Fabric banners are a much more versatile banner option. They can be stored and transported more easily as there is very little threat of tearing or damaging the banners. All of our fabric banners are stretch fitted, so, even if your fabric banner has been screwed up in storage and transport, there will be no creases on your display as the fabric stretches tightly to fit out exhibition displays stands.